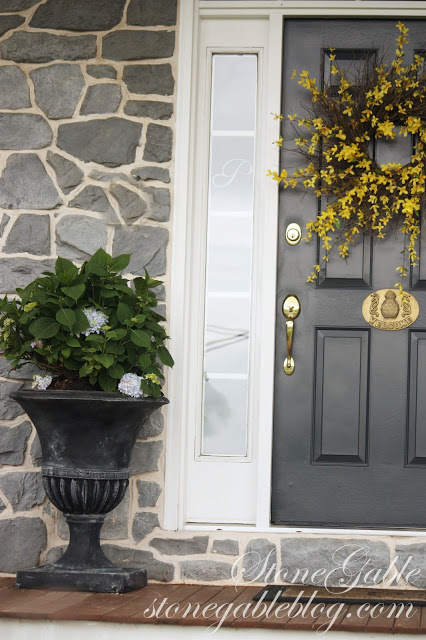 Two big urns sit on either side of my front door. 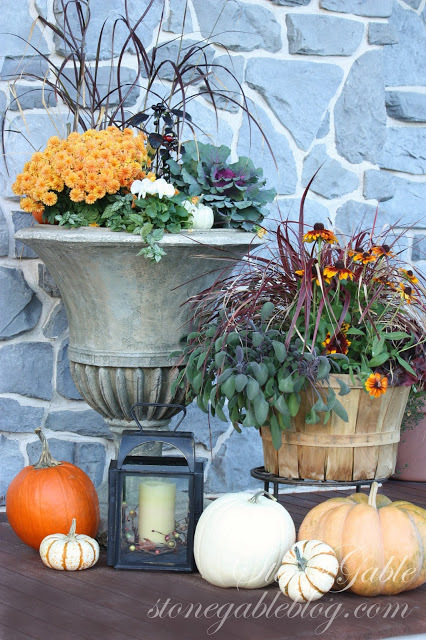 Over the years they have been filled with flowers of all kinds, pumpkins, and evergreens. One year a scarecrow sat in one of them. TheY have such a fetching shape but I never really liked their color! They did not work with the limestone on our home. 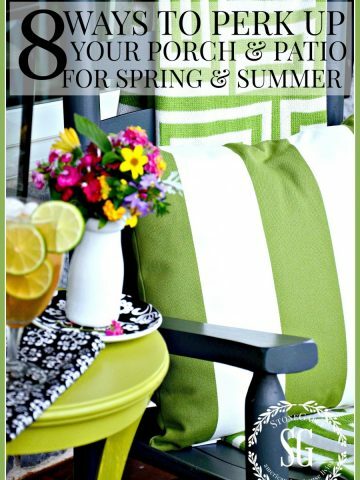 Today is THROWBACK FRIDAY and I’m sharing one of my most popular posts on Pinterest! Did you know that I have over 3,500 posts in my archives? I bring out one of my reader’s favorite post to share with all my new reader and for my faithful readers to enjoy again! And you can also see how my photography has improved (I hope!). 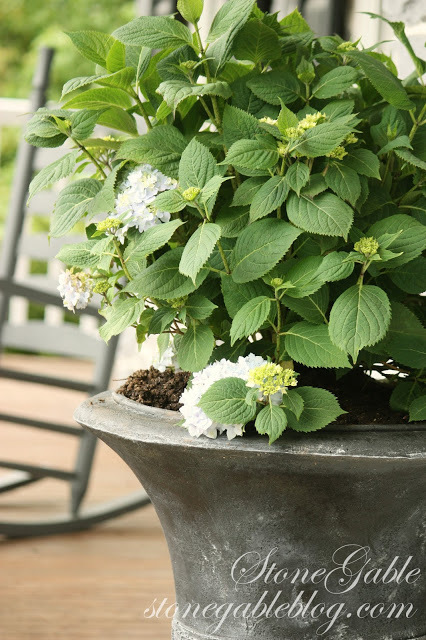 I’ve used this technique on so many pots, urns and planters around the house… both inside and out! 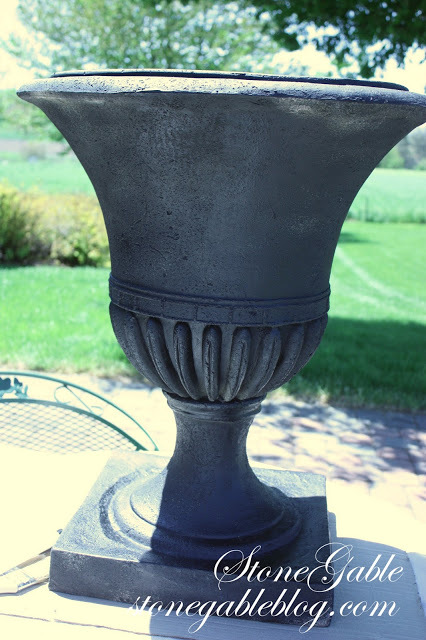 So let’s upcycle an urn! Here is how they looked BEFORE…Totally the wrong color against the Pennsylvania limestone. 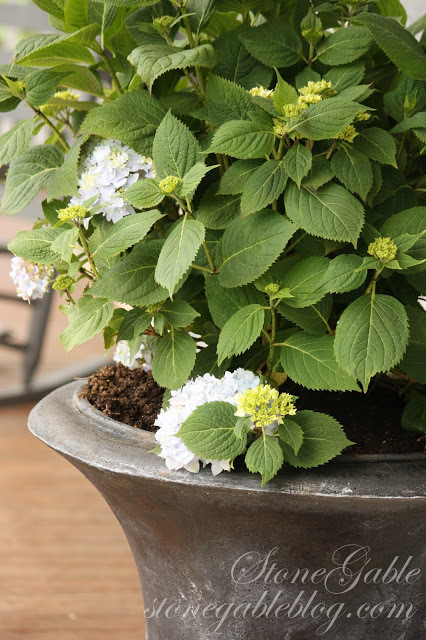 Here is how they look now planted with blue hydrangeas for this summer. Bobby helped me with this project because the pots were HEAVY! First, we took all the dirt out of them, scrubbed them clean and let them dry. 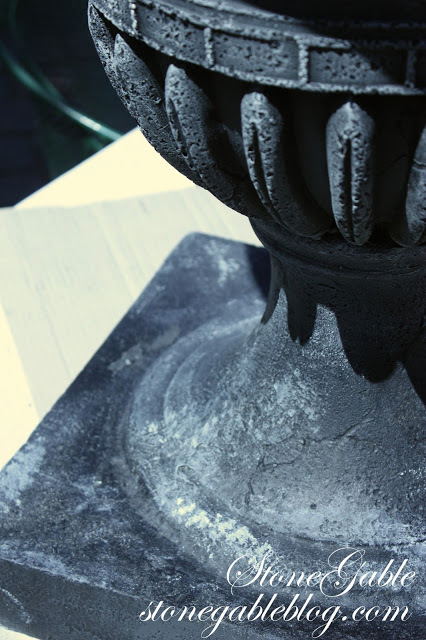 I gave the pots 2 good coats of flat black Rustoleum spray paint for indoor or outdoor use and let them completely dry. So easy-peasy, right? 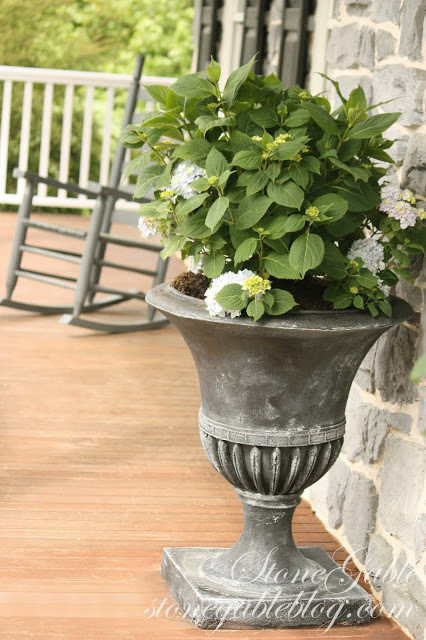 I then used Annie Sloan Chalk Paint (ASCP) in Graphite and painted between the raised parts of the urn. Graphite also was painted on the rim and dabbed here and there on the body of the urn and the base. Can you see the subtle difference? I poured 2 puddles of ASCP in French Grey and Old White next to each other on a paper plate. I dipped my brush into half the Grey and half the White and dabbed most of it off on a paper towel. I then brushed and dabbed the raised parts of the urn and also the areas near and over the cracks on the body of the urn. I did the same technique to the base of the urn. Be creative and artistic. I kept adding more paint and turning my brush so the colors would melt together. I applied a few light coats instead on one heavy coat. If too much paint is applied a soft damp cloth will remove most of it. I kept going over the piece with Graphite, French Grey and Old White until I liked how they blended together. Finally, I took my brush and dipped it into Old White and removed most of the paint onto a paper towel. I then dry brushed the raised area with the Old White. 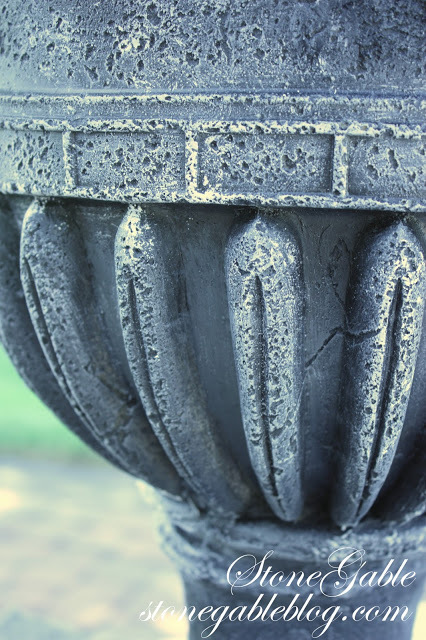 Aging a pot or urn is an artistic endeavor so there really is no right or wrong way. What matters is that you like it!!! Here’s how the urn looked when it was finished. When the urns dried I could have sprayed them with a fixative, but my urns sit under a porch so they are not subject to the elements. This was an easy sunny afternoon project. Now I like their color against the stone of my house. You might want to save this project to your DIY or PROJECT Pinterest boards. 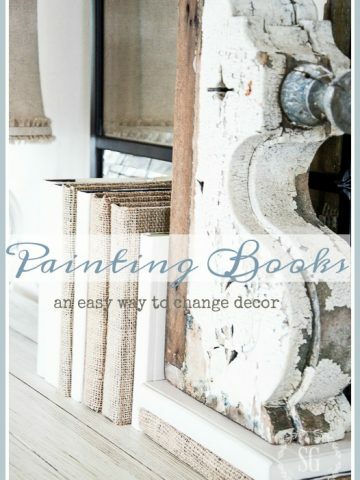 You can follow me on Pinterest HERE and see all the great things I’m finding to pin! This looks amazing. I am going to take a stab at it. 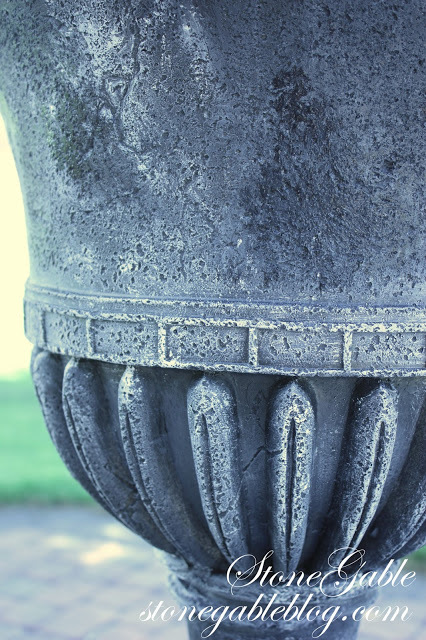 But, before I start, I did have a quick question… How do you make the flat parts of the urn look most natural? I am concerned that it will have even sweeping marks (if using a brush or a cloth). 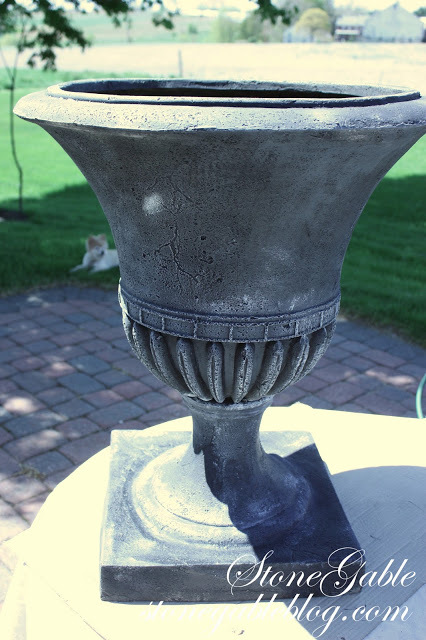 The urn I have in mind does not have any natural pitting to naturally break up the paint (it is smooth due to year and years of coats of paint). Any advice would be helpful! Happy Holidays! Hi Jodi, if you see you are getting brush marks dab it with a brush and then a rag. I hope this helps. 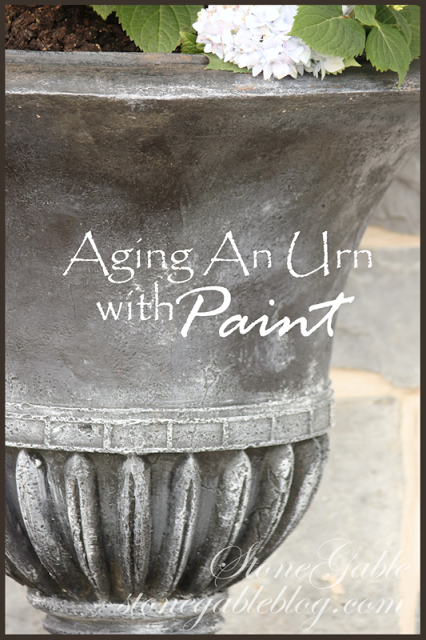 I really appreciate this post, as I have some urns that need to be redone due to peeling paint, etc. This is really helpful. Thanks! Very impressive! I love what you did with the urns Yvonne. I’ve fallen in love with urns just from seeing how you decorate with them. Thanks for all you inspire in your readers, Yvonne! I do very much agree with April!! Love all your post, some more than others but their all great. I am a new reader who also enjoys your blog and especially your beautiful photography. I would like to weigh in about Marcy’s comment. I think she was very polite and said how much she enjoyed the posts. Those of us who follow our favorite blogs understand the ads generate an income and we are happy for the bloggers to benefit in that way. I believe Marcy was not objecting to having ads, but rather to the manner in which they appear on the screen. As a newer reader I can say that compared to other blogs this one is visually very beautiful but the experience is marred by banner ads stretching across the screen often obscuring the bottom of the gorgeous photographs. If you try to click on the tiny “x” to close the ad very often it takes you to the ad site instead. I often read on my phone and I know it is harder to format ads for phone viewing because the screen is not as wide. Perhaps placing ads at more natural breaks in the text would help, instead of between a before and after photo for example. I know other bloggers struggle with this problem as well. It is a fine line between wanting your readers to see the ads but still having a pleasing experience and appreciating what you work so hard to create. I think honest feedback about this is an act of generosity. Hi Sojourner, Thanks for your comment. I have no control over where they are placed. I did not “opt in” for an add that would take up about one-fifth of the page. If you are reading most blogs it is just a part of the blogging world now. I think your urn turned out fantastic! You give me confidence to try DIY myself. Thank you for your hard work. Those look fantastic! Maybe I missed reading it, but what are the urns made of? I have some plastic ones I’d like to upgrade, but not sure the same technique would work on plastic. Hi Rebecca, Mine are a composite material. Hope this helps! Keep up the great work Yvonne. Also Marcy you know the old saying if you don’t have something nice to say don’t say anything at all maybe you should take that advise. You do realize Yvonne is doing this for a living and that is what she needs to do to make this blog work it cost money! I hope you don’t watch tv because that all you get is ads.I don’t understand people that just have to continue to complaine the world would be a lot happier if we would just keep our negative thoughts to our self. Yvonne needs words of encouragement not words that will tear her down. Yvonne just don’t listen to people like that you can not please everyone just be happy love the Lord your family yourself and everyone else even our enemies and you will be like Jesus Christ our savior. Have a wonderful day Yvonne and continue with your great work there is more encouragement than negative comments. April, Thanks so much for coming to my defense! You get it. I could never produce StoneGable on our home budget! They look great, like aged concrete to me! Great way to upcycle and make em’ the way you like em’. Hi Isela, we got that about a decade ago on a trip to Charleston, SC. I’ve read all of your posts and am a daily reader. I love your blog and these older posts. I have a pot I found in our shed when we cleaned out the previous owners belongings (I also found an 1800’s church hymnal too!!). Can’t wait to try this technique on that pot. Happy Friday! I enjoy your posts always. Unfortunately, there are so many adds covering pics and paragraphs that it is no longer enjoyable to read. Sorry about that Marcy! Ads are just a way of life in the blogging world. It takes a tremendous amount of work and money to produce a first-class blog. I am very thankful for the companies who help me keep StoneGable alive. There are no more ads on my blog now than 3 years ago. Actually, there are less. I “opted out” of a bottom ad that many other bloggers use as I thought it covered up too much of the page. There is a little X on each ad and with a quick click they can be removed. I know it’s hard to understand for someone not in the blogging world but there is so so much that goes into blogging each day. I also spend over 60 hours a week producing what you see and hundreds if not over a thousands of dollars goes into blogging each month. I could NEVER sustain StoneGable on my house budget. I’m so sorry these ads bother you, but without them StoneGable would be gone for good. I hope this helps you to understand better and you can just ignore or click the ads closed and continue to read StoneGable. I can’t buy ASCP in my local area. Is there a reputable source where I can buy online? Thanks! Hi Val! 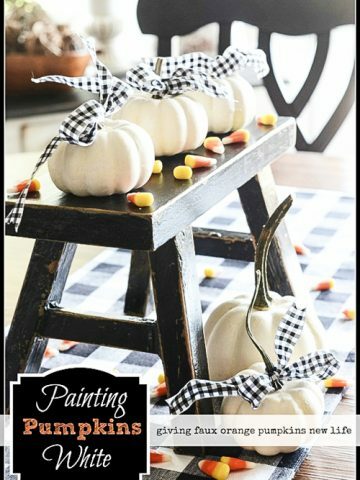 I’ve been using Amy Howard At Home ONE STEP paint. 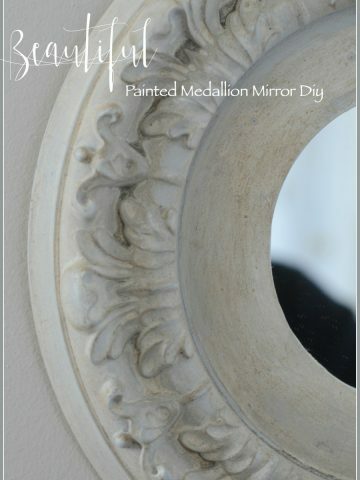 It is a fabulous chalk paint and you can get it at your local Ace Hardware. It’s really the best! I love this idea. Thanks so much for sharing the instructions. Have a wonderful weekend! Yvonne – You always inspire me with your projects and today is no exception. Thank you for sharing these step by step instructions.